After printing and distributing flyers and posters, plus advising the local papers, we had around twelve people attend our initial meeting, including several keen committee members. Between my introduction and Harald’s explanation of the Trust’s background, we answered many questions and felt confident of a need for our services in Auckland. We attended the Toddler’s Day Out, March 2nd Waitakere City, we met many people, we were very busy, sharing our flyers, magazines and booklets, always running out! At one stage, we were visited by the Prime Minister Hon. Helen Clark, a lady from Poland who runs the Child Connection Trust, Plunket, Parents Centre and other west Auckland representatives from Barnardos, Porse and many Kindergartens. We also attended the Teddy Bear’s Picnic at the Domain, thanks to Paul Catton, and it was noted that with so many punters, we should be there next year as well. We also attended the Onehunga Community Services Group meeting, spoke briefly and outlined our intentions, met several new contacts and shared flyers. Our next meeting was at Onehunga Community Center, next to the library and a very new, well presented building. We had four new members including two from the previous meeting, including Eva the Child Connect lady. We enjoyed her outline and agreed to write an article on her program. The demand for flyers has seen our limited supply run out completely, our next batch of 200 expected this week will almost certainly be exhausted right away. I have heard from a West Health nurse met with the intention of setting up a teenage dad support program. He has had several questions answered by Harald and is holding a meeting in Early May. I also met a west Auckland Plunket lady who is trying to encourage a few young dads in Glen Eden. From the start of next school term, ie Mon 5th May, we will invite solo or young dads to a Jingle and Jive song and dance event for toddlers. For $5 they can come along, participate and have tea afterwards. There are similar sessions in the library on Thursdays so we expect a bit of cross-over promotion but we need to advertise and promote it too. I see this as a great way to involve local fathers and potential helpers. We have set 5th May for our next meeting and expect a few new members. 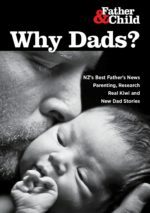 While the next visit from Harald will be later in May and should allow us to have a New Babies magazine launch in Auckland, there may not be time to arrange a Dads and Babies Talk, as being held in Palmerton North, but I hope Harald can meet the Parents Center people and agree on a date. As you may have heard, we were awarded approx $8k from Lotteries for event, salary and office costs.